ShortCode SMS business simply involves setting up a system that allows you to use a "short code" to provide variety of mobile content through text messaging. People that subscribe to your "shortcode" are billed automatically by their network provider and you get your own share from it. Ever wondered how and why certain unusual GSM numbers keep bombarding your phone inbox with massages that either interests you or not? When you are you are interested you perform ‘a call to action’ that automatically deducts a value from your airtime. The idea behind all the often ‘call to action’ massages in your phone inbox is what we call short code. You always blame Mtn, Airtel, Glo, Etisalat and others for the money deducted from your GSM account balance after you respond to messages from these unusual numbers. It is true that the service providers have hand in those deductions, but they actually share the proceeds with smart Entrepreneurs who operate the short code business. Experience shows that not too many Nigerians know about short code messaging operation, let alone its business potentials. Short codes are divided into two categories namely: Shared or associated short code and dedicated short codes. These are short codes used by multiple brands, who share the setup and running costs to make short codes operation cheaper for smaller business owners, who may not be financially sufficient to operate dedicated short code. These are exclusively owned and operated by a single brand that takes full responsibility of the setup costs and fees of the short codes. (1) Text to win promos: often time you see messages in your phone inbox asking you to text a particular word to a certain 4,5 or six digits number and win a prize. e.g. Text Arsenal FC to 33842 for free ticket to watch FA cup final at Emirates. (2) SMS Voting: Opinion polls on most political and social issues are conducted by the use of short codes. (3) Mobile Banking: Texting a certain word with an account detail can perform a bank service for you at one click. (4) Social Surveys: short codes are used by Researchers to conduct social surveys to gather data for their researches. (5)Health Tips: Short codes are used to disseminate information on health tips. (9) Validation of pins e.g. ATM pins, Mobile token etc. Why Are Short Codes Preferred to Traditional Advertising? (i) Short code numbers are easy to remember. For instance, you don’t need minutes to memories ‘send yes to 38842’. (iii) Short code engages prospective customers or consumers at the point of display. The prospect for short code business in Nigeria is high and positive given the number of GSM subscribers in the Country. However, how many people you can attract to perform a call to action on your message determines how much you can make out of your shout code business. There is no limit to how many thousand, Million or Billion you can generate on your short code business, even if you lie in your house and sleep. That is one can make money in the short code business. It is even more interesting as the entrepreneur can use his time to exploit other business opportunities. If the short code operator can be able to attract 2-5% of GSM subscribers in Nigeria to take action on his messages, that means good sum of money to look out for in the bank. How to Start a Short Code Business in Nigeria? A good business plan serves as a road map to direct your actions and decisions until your business become a success. Your plan should include the business name, strategy on how to operate your short code business and who to involve in the whole process. Like every business in Nigeria, certain rules apply in operating a short code business. Your knowledge and application of those rules will contribute to your success. Breaking the rules may result to punishments as severe as shut down of your short code business by the Nigerian Communications Commission. All the rules you need to avoid trouble are clearly stated in the Nigerian Communications Act 2003. Short code messages are target at people with specific interests. If can identify an audience who are interested in your message, you are good to go. In short codes business operation like other content related online businesses, keyword is the priority. Thus, frame a unique keyword peculiar to the idea you intend to spread in your short code messages. Note that your keyword must lie between the 4-11 characters. I believe that will take a good part of your brain in reasoning. Make sure your keyword and number are easy to remember. There are many short code setup companies in the Country just as we have different service providers. The popular short code setup companies are online advertisingng.com, guarantyshortcode.com, supreme shout codes etc. (a) Study the short code setup company to know their status in terms of the nature and level of service they provide to their customers. (b) Crosscheck the richness of their available information to help you make a decision on your short code operation. (c) Crosscheck for availability of means of resolving complaints arising from content service. (d) Crosscheck the terms and conditions of the setup companies and network operators in terms of price. Promote your short code business: disseminate your short code messages to your target audience accordingly. Stay focus and monitor your business grow and leverage on the diverse income streams your shout code provide. The short code income streams are those that accrue to your account when GSM subscribers send texts to your short code number. 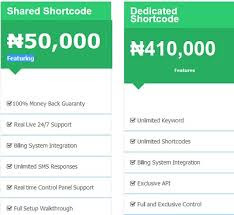 Another stream of income for your shout code business is when you use the numbers collected on your short code number to conduct SMS advertising. The advert could be to promote your own product or service, or to advertise for a bigger company who usually pay big for such services. Starting any business in Nigeria can be challenging but making it grow to yield profit is even more challenging. Nevertheless, you are good to go in short code business when you know its workings very well, and knowing this is not more than following the guidelines outlined in this article. Your success in the short code business is 99.9 percent guaranteed if you apply the simple guides. 0 Response to "Make Money: How to Start Short Code Business in Nigeria and Make Money From it"